He's a royal heir who can't clap. She's a cross-dressing giant. Together, they fight crime! With more named characters than the Bible, Game of Thrones needs to find a way for those characters to interact that doesn't involve all of them being in one place at one time and blending into the background. So one of the things the show does best is craft little "buddy comedies" as people get split off. Like Brienne and Catelyn. Or Brienne and Jaime. Or Brienne and Podrick. Brienne is the only living child of Lord Selwyn Tarth - her younger sisters siblings died in infancy, and her older brother drowned. She comes from the Island of Tarth, off the east coast of Westeros, a beautiful place called "the Sapphire Isle" for the clear blue water that surrounds it. Brienne herself is large and muscular, and dreams of becoming a knight - she was named to Renly Baratheon's Kingsguard after defeating all his men in a tournament. Brienne is played by Gwendoline Christie, a 6'3" British actress. 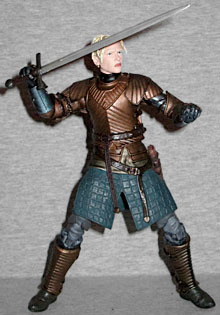 The character is described as homely, and derisively referred to as "Brienne the Beauty" - Christie is much more attractive than that, so the toy is as well. She looks angry, but even that's not enough to make her ugly. Her short hair is detailed nicely, though it could stand to be messier than it is. She's wearing her full armor, which looks very nice. Her breastplate and the panels that go over the top of her shoulders have triangular ridge patterns, and it's matched by her greaves. 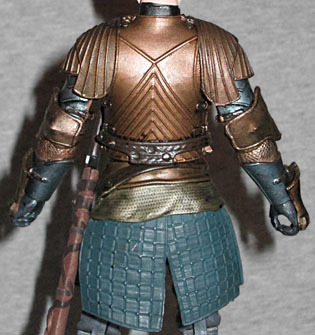 There are more traditional plates of armor on her biceps and waist, and she wears a shirt of chainmail beneath it all. She has armored gloves, and soft PVC flaps over her wrists and elbows. Her gambeson is mostly hidden beneath her armor, with just the lower edge sticking out below her hips. It's greenish blue, and has quilted squares. 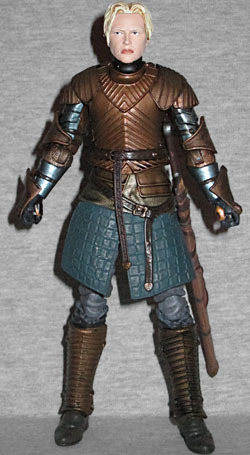 Brienne can't be a knight if she can't move like one, so the figure has swivel/hinge joints at the ankles, wrists, elbows and shoulders, double-hinged knees, swivel thighs, and balljointed hips, torso and head. None of the joints required any excessive force to get moving, and nothing broke, either. A toy that works the way it's supposed to straight out of the box? What a novel idea! We only get one accessory, Brienne's sword. It fits in the scabbard at her waist, and since the scabbard is attached below her waist joint, you can actually turn her chest out of the way to get the sword in and out easily. It's a simple, unadorned blade, and can be held in either hand (after you pry the thumb open far enough to get it in there). It's kind of a shame they didn't give her her distinctive helmet, too. In the show, Brienne is almost as tall as Sandor Clegane - the Hound. This figure isn't quite that huge (she stands 6¼" tall), but is still plenty sizeable, and an excellent representation of the character.